mikael tobias, one of the original founders and noise makers of practice, moved to copenhagen a year ago. 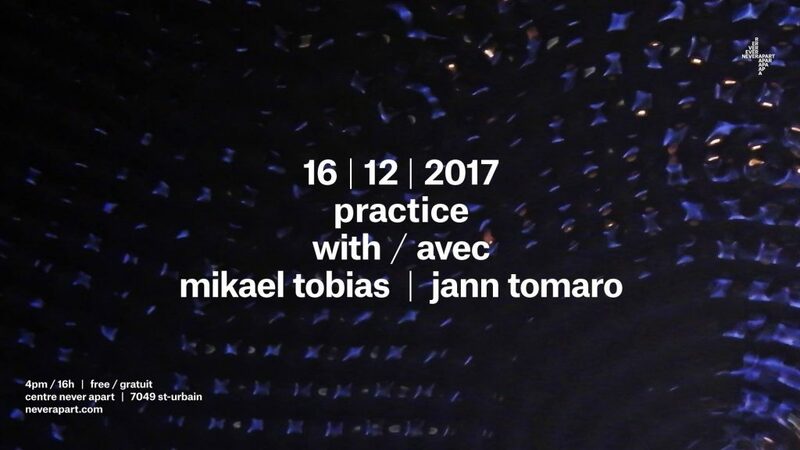 while visiting montreal this december, tobias has graciously offered to play an experimental set for practice. in optics, an aperture is an opening through which light travels to focus into an image. in the human eye, the iris and pupil work together to form the aperture, contracting and dilating to regulate the amount of light admitted. imagining this process in sonic landscape, tobias explores the psychoacoustic opening of the mind using noise as well as organic and synthesized sounds. slowly blending, expanding, and toying with the interactions between frequency and rhythm, this set transposes aperture from light to sound, decelerating the process by multitudes. deliberating, mikael builds tunnels of sound that weave and entwine through the air, slowly unfurling and brightening. in sympathetic resonance, the mind and body can allow for a state of consciousness to bloom and unfold, increasing sensitivity. with heightened openness, thoughts may become clearer and physicality may be more embodied as the sonic environment envelops the listener. practice is an investigation of the capability of sound to induce different transcendental states of awareness and being. through a series of noise sets, practice explores the experiential application of theories underpinning the transformational properties of sound, such as cymatics, music therapy, sound healing, brain entrainment, and binaural-beat perception. each session features a noise artist, who, informed by their own knowledge of sound, creates a immersive set intended to bend consciousness. listeners are encouraged to embrace a receptive, meditative attitude during sets. we don’t mind if you’re new or old to noise or meditation. if you’re curious to be engaged, to open yourself to new experiences and to hear some noise, then join us. we have yoga mats available to use and listeners are invited to bring their own sitting paraphernalia if they please.